The ‘Pack curling team is currently attending the USPORTS nationals after having won the Western Canadian University Championships. The team, captained by Corryn Brown, consists of members Erin Pincott, Dezaray Hawes and Samantha Fisher to complete the quartet. Thompson Rivers opened with a 10-7 win over the Queen’s University Golden Gaels, at the Ken’s Furniture Arena in Leduc, Alberta. On Saturday night TRU were beaten by the host foursome: The University of Alberta Pandas. The Pandas, led by Kristen Streifel, stayed unbeaten by beating the TRU 10-5. The Pandas scored three in the third end and had a four ender in the 10th end to grab the victory. TRU had a 1-0 lead after the second end. They added a single in the fourth, two in the sixth and one more in the 8th. As a rink, the WolfPack curled 78 per cent. Brown curled 78 per cent on her own. Pincott shot 80 per cent, Hawes 73 per cent with Fisher curling with an 81 per cent success rate. Alberta had an 89 per cent success rate. TRU then beat the Brock University Badgers led by Terri Weeks 8-2 on March 25. 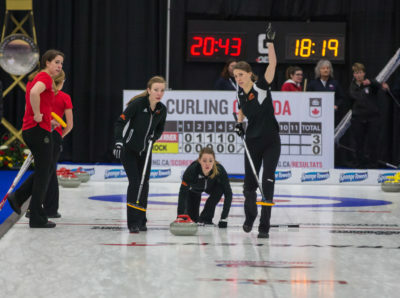 The loss was the first for Weeks and the Badgers and a remarkable win for the WolfPack women’s curling team. TRU, along with Alberta, Mount Allison and Laurier are all leading the round robin standings with two wins and a loss. TRU scored single points in the second, third and fourth ends to move to a 3-0 lead after five ends. Brock added one in the sixth end to cut the deficit to 3-1. The WolfPack added one point in the seventh to move to 4-1. The Badgers closed the deficit to 4-2 with a single point in the eighth before TRU added four in the ninth to get the win. Brown curled 86 per cent in the game. Third Erin Pincott was at 78 per cent, second Dezaray Hawes curled 72 per cent and lead Samantha Fisher had a 92 per cent success rate.